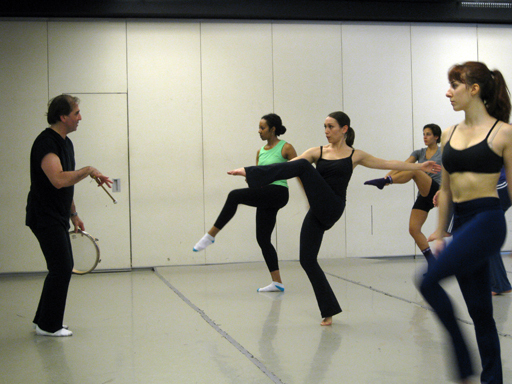 On Friday, October 19th, Jazz Choreography Enterprises (JCE) sponsored a class on the jazz technique of Matt Mattox taught by choreographer Bob Boross. Held at DANY Studios, this class was a supplement to the performances of the New York Jazz Choreography Project (NYJCP) that took place on October 19th and 20th at the Manhattan Movement & Arts Center. As part of JCE’s community outreach program, the class was also free for all who attended. During the opening of the class Mr. Boross explained that Mattox taught in New York City, primarily training his students for theater performances. His style combined the jazz dance of his mentor, Jack Cole, with his own balletic training. Mattox currently lives in Europe, and there are very few instructors who teach his style in America. Mr. Boross is one of them. He said that Mattox had very high expectations for his dancers, which made him difficult to work with and may have contributed to his style being less popular in the States. The dancers attending the class were all young and experienced, and several of them had performed in JCE productions. This was fortunate, since with only a two-hour time slot, Mr. Boross provided something of a crash course on the technique, showing the dancers a multitude of exercises in the style. To the untrained eye it appeared like a frantic game of Simon Says, but the dancers were able to pick up the movements quickly. At least most of the time. He went on to explain that the idea behind the style is to always be fluid, but that’s difficult to do when you initially learn it, since it is so unlike most other dance techniques. However, he said that once you study it regularly for a while, “you’ll have it.” After the warmup exercises, Mr. Boross gave a combination with movement taken from “LIFE,” a contemporary jazz piece he choreographed for the NYJCP performances on October 19th and 20th. I spoke with Skye Mattox who performed in the October 2012 production of the NYJCP for choreographer Sidney Erik Wright and who is also Matt Mattox’s granddaughter. Ms. Mattox had never actually had a chance to study her grandfather’s style, and this was the first class that she learned anything about it in depth. Her training was primarily in musical theater and jazz, and though she was familiar with Jack Cole’s style, her grandfather’s is very different. “It’s hard as hell, but so good,” she said of the technique. She felt it was a strong technical style that could really help to improve a dancer. She also expressed sadness that there weren’t very many people in the States who taught the style, feeling that a lot of dancers could benefit from it. “I would take more classes if I had the opportunity,” she said. JCE plans to expand its outreach programs and provide more classes that are either free or at a reduced cost to any students attending. In time, Ms. Mattox—and other dancers who want to learn more about jazz dance—will have that opportunity. Join our free mailing list for advance notice of concerts and more. Jazz Choreography Enterprises, Inc., encourages the creation of jazz dance in concert form. We want to give choreographers, dancers, and audiences the chance to learn about jazz dance: how to create it, perform it, and appreciate it. © 2008-2017 Jazz Choreography Enterprises, Inc. All rights reserved.